Is it possible to create a line-based family that is placed by picking a 3D edge in a 3D view, and the host will be that edge and not some horizontal work plane or level? It almost needs to be like a combination face/line hosted family. One use would be for things like roof ridge vents, or hip/ridge tiles for a tile roof. Last edited by PatrickGSR94; July 17th, 2018 at 07:53 PM. If you set your workplane to the surface you're adding the family to, you can draw on that line. I'm fairly sure choosing it as the host is impossible. Line Based Generic Models CAN use Pick Lines, to select an Edge. But the workplane WILL be one of the two faces of the roof, and it will orient it self as such. Only way around that is adaptive components, per (perhaps) a structural framing family. But... yuck, on both counts. I just make my Ridge Vents modeled off one plane of the roof (as the LBGM) and they work great. Yep I noticed that behavior of the tilted ridge vent. Another thing I wanted to make was a line-based family for those RainhandleR rain dispersion louvers, which have little brackets every so often, and then 6 louver blades running continuous long the roof. I succeeded in making a railing family that works pretty well, and I can pick my roof fascia trim if I have a level datum in that spot. But I'd rather have an actual family that can be saved and loaded instead of a system family, and picking the edge in 3D is so much easier than trying to draw it in plan or elevation, picking a work plane, blah blah blah, especially when there are many of them around a roof. Another thought: what about nesting a line-based family into a face-based family??? Doesnt work that way. Besides: A LB family is already a Face Based Family. Honestly, i have some LB Louvers, and i dont like them. Id rather completely unhosted or Face Based and stretchable. The User Experience on the Line Based ones isnt that awesome. For Ridge Vents, all day long. Louvers, i wouldnt do it. Agreed regarding louvres. Also, LB families have that habit of auto-joining in line and at corners precisely when you don't want them to - and there's no option to disallow joins like you can with say, walls. These aren't "louvers" like you normally think of louvers in a wall, they're a gutter replacement product. So they run along the edge of a roof eave/fascia. 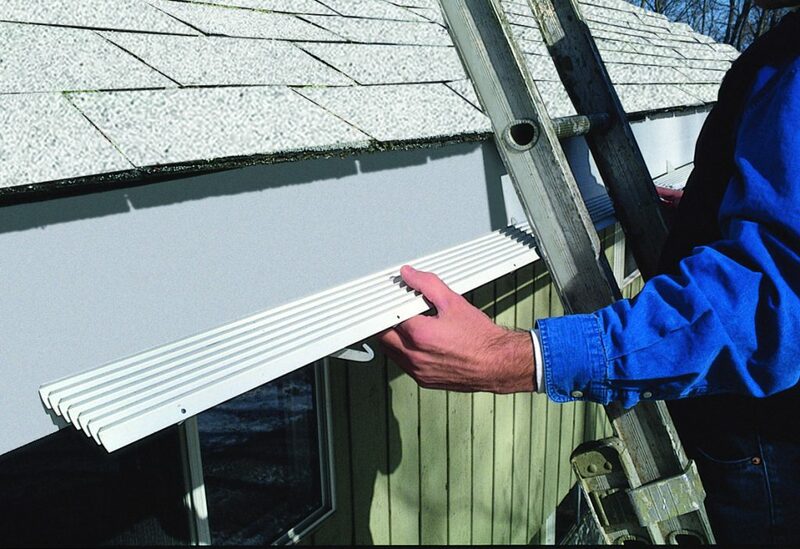 Instead of a single metal profile like a normal roof gutter, they're small brackets spaced out with 6 little metal strips running along the length to create a "gutter" that disperses rainwater evenly instead of it just spilling off the roof. I used to use a solid profile that was the shape of the bracket to represent the product, but it never looked right. Making them as a railing makes it look right, it's just not the most user friendly or the easiest to load into other projects. Last edited by PatrickGSR94; July 18th, 2018 at 08:46 PM. Yeah, i would do those as Face Based (non line based) families. If a profile could have multiple loops, that would work as a fascia, I bet. Edge based family + schedule possible?? ?